This is a model of a Gas Cylinder. Originally created with Blender 2.79 and textured using Substance Painter. This model contains 3 separate objects. This model contains 1528 polygons. This model contains Blender Cycles materials. 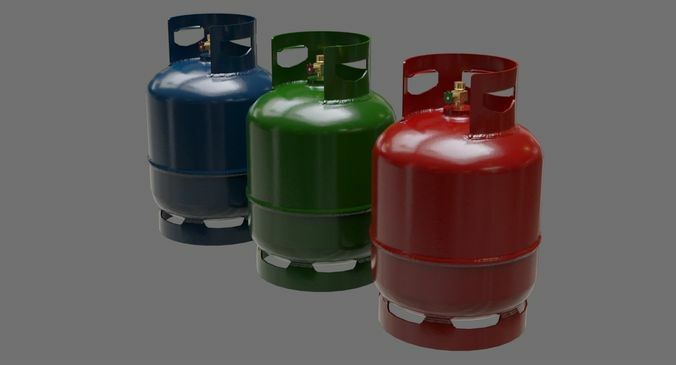 Gas_Cylinder_1A_AO.png 1024x1024. Gas_Cylinder_1A_BaseColor_Blue.png 1024x1024. Gas_Cylinder_1A_BaseColor_Green.png 1024x1024. Gas_Cylinder_1A_BaseColor_Red.png 1024x1024. Gas_Cylinder_1A_Metallic.png 1024x1024. Gas_Cylinder_1A_Normal.png 1024x1024 X+Y-Z+. Gas_Cylinder_1A_Roughness.png 1024x1024.